This extremely popular style of leather reception seating is now available at a very special Modern Office promotional price! Offers the professional image waiting area you need at an exceptionally reasonable cost. Flexible transitional design works well with most decors. 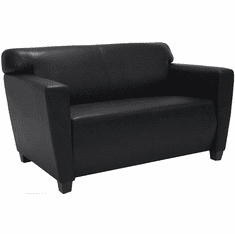 Handsome matte finish Black bonded leather upholstery. Choose from club chair, 2-seater, 3-seater, powered/charging ottomans as well as concave and convex pieces for a totally unique reception arrangement. IN STOCK! 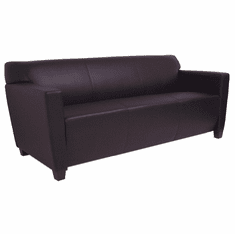 * Gentle reclined position and softer foam seat for an inviting reception area. * Commercial grade construction for the busy office and waiting area. 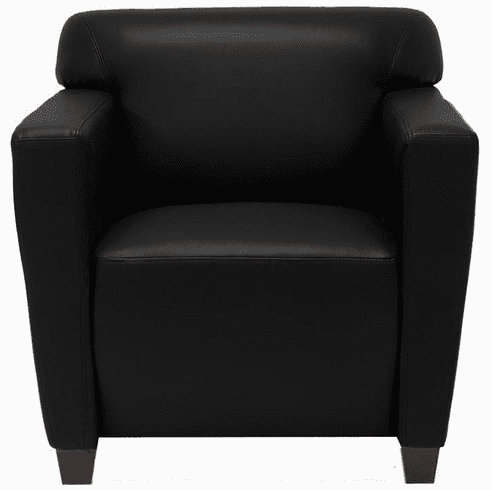 * Seating surfaces and armrests are upholstered in commercial grade matte finish Black bonded leather for excellent wear. 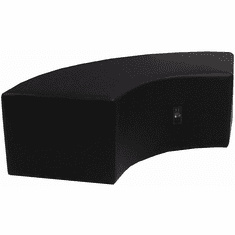 Backs and sides are upholstered in a matching Black vinyl. * Hardwood framework for strength and durability. * Include both Dark Cherry color block feet and Chrome finish cylinder feet for your choice of style. * 250 lb weight capacity. * Ships mostly assembled! Just screw in the feet! * All components exceed ANSI/BIFMA commercial use requirements. * Meets CA fire foam approval. 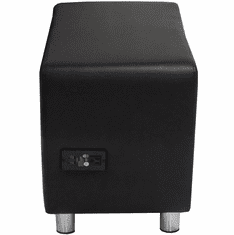 Comes with a choice of either Dark Cherry color block style feet or chrome finish cylinder feet - both sets included! Seat measures 22"W x 21"D x 18"H. 36"W x 33"D x 31"H overall. Shipping weight 59 lbs. All components exceed ANSI/BIFMA commercial use requirements. Meets CA fire foam approval. 5-Year Limited Warranty. PRICE INCLUDES SHIPPING! (Truck shipment - see Terms & Conditions).